We choose to live in Middletown for a reason. It's a great place. Good schools, a rich history, scenic roadways, farmsteads, forests, waterways and the ocean in our backyard are just a few of the reasons we call it home. There's also a mature retail landscape with all the amenities and conveniences one needs. It's a country suburb and we like it that way. We know development is inevitable. However, the irresponsible overdevlelopment proposed in the Village 35 application is unacceptable. Village 35 threatens our Quality of Life, puts neighborhoods in peril, and burdens every aspect of what makes Middletown a great place to live. Minding Middletown, Stop Village 35, is a citizen action group formed to protect the quality of life in Middletown. The group is comprised solely of volunteers - residents and neighbors - who care deeply about the long-term health of Middletown, its neighborhoods, and its families. 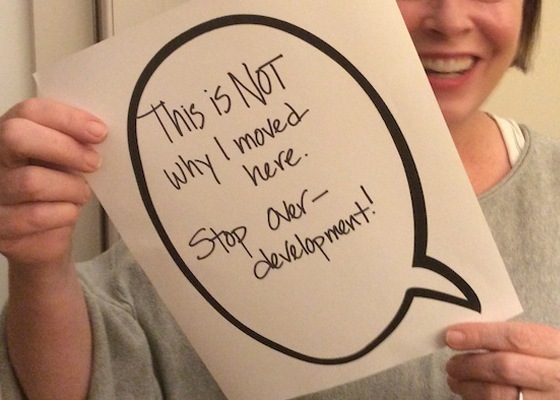 We believe that the proposal known as Village 35 lacks vision. It brings business-as-usual redundant retail, more of the same fast-food restaurants, and a cinema bordering Kings Highway East neighborhoods, along with affordable housing high-rises segregated from densely packed townhouses, no usable open space, and traffic patterns that benefit the developers, not the community. We know development is inevitable. But the last expansive green space on Route 35 should not be squandered on the likes of Village 35 applications. We believe responsible development is paramount to a sustainable future for our quality of life in Middletown. 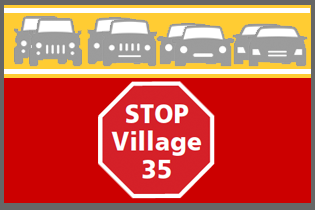 Village 35, as proposed, is not it, which is why we are opposed. • A development that complies with the imposed Planned Development Zone Requirements: no variances or waivers. • Per the Middletown Township 2009 Master Plan Re-examination report, the stated goal for this site should be adhered to. Goals include: public spaces for active and passive recreation. In the current Village 35 application, there are none, only drainage basins and wetlands; these are non-usable areas whose land mass is applied to "open space" percentage. • Traffic patterns, lighting and noise should consider the needs of and be "appropriate" for the surrounding neighborhoods that have been built adjacent to this property over the years. • Middletown’s historic areas and scenic roadways should be preserved in keeping with the character of the community. Kings Highway East is designated a scenic roadway in the Township’s Master Plan and should stay that way. A sustainable retail/residential complex that incorporates usable open space while providing unique retail and residential opportunities for the public is desired. -- A development based on the principles of “placemaking,” where residents live, work, shop, and meet, and families play, all within a few minutes’ walk of their homes, in order to create a less drive-dependent existence. A “Place” where a community center provides a gathering hub as well as a "commons" transportation depot with transit links. -- A landscaped neighborhood with environmentally-responsible features and where LEED-certified building is adhered to. -- A community where retail serves as an amenity for the "neighborhood," and office space provides an environment that fosters SMEs and small business incubation alike. Ultimately, we’d like to see Village 35 as a “Place” that celebrates and incorporates all that we love about Middletown --its history, its scenic beauty, and its farming heritage. Our goal is to leave a legacy that we can be proud of for future generations.